With prices dropping across most gadget categories, more and more people are looking for headphones with high-quality sound at a low price. It’s a quite challenging and daunting task to find cheap headphones that are really worth it, especially given that there are hundreds of models in the market. 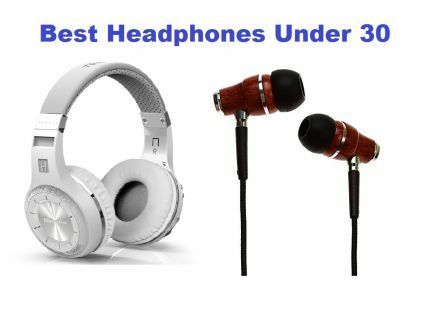 After extensive research, we have identified, evaluated and ranked the top 10 best headphones under 30 dollars. Our analysis and rankings include all types of headphones, and are based upon a wide array of features, including audio performance, build and design, and additional features. As mentioned, as analysis covered all types of headphones (section 1 below) and took into account a plethora of headphone features (section 2) – which are outlined below. There are 3 different kinds of headphones in the market. Firstly we have the in ear headphones also known as IEM (In- Ear Monitors) these are the smallest and most portable of all headphone types. Each earbud fits into the ear canal. Secondly we have the on-ears also known as supra aural headphones, these headphones literally sit on your ears. And lastly we have the over ears, also known as circum-aural headphones, these are the largest of headphones and often the most comfortable to wear. These are the core elements of any headphones, the drivers are used to convert electrical signals fed to the headphones into an audible sound signal that can be perceived by the human ear.There are various different types of drivers that offer different quality, furthermore different types of headphones also have different drivers. Drivers fire both into and away from ear.An open back allows sound to escape outside while the closed back does not. Both are useful for different purposes. This denotes the full range of sonic frequencies that a pair of headphones can achieve. This element causes you to feel like you are at an actual concert by separation and clarity. This is not mentioned under features but can be judged via reviews. This represent the amount of power needed to drive a pair of headphones. So basically for devices such as smart phones and portable players you would need low impedance headphones. While high impendence headphones will require dedicated amplifying systems. 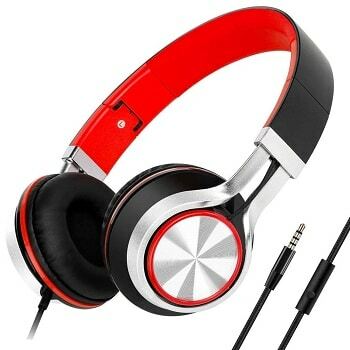 Apart from considering the different headphone types and characteristics, we have also taken into consideration, the quality of the brands / companies that have produced the headphones under 30 dollars, and have picked the ones that have received strong customer reviews and ratings by customers and industry experts alike. The musical experience is that of a concert with these headphones, you will hear exactly what the singer (or audio) wants you to hear. With the turbine style housing and drivers that offer a low frequency shock, you will feel the base resonate in your chest. The headset obviously makes it to number 1 on our list with its clear and transparent base, mids, treble and all the features that the headset offers. Our number 1 pick has, Bluedio: 57mm ultra-large dynamic drivers. To make an impact you won’t forget. 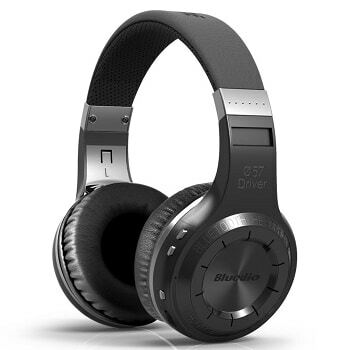 The headphones have Bluetooth 4.1, which has a high speed CPU. The Bluetooth 4.1 offers 40 hours music, 45 hours talk and 1625 hours standby time. 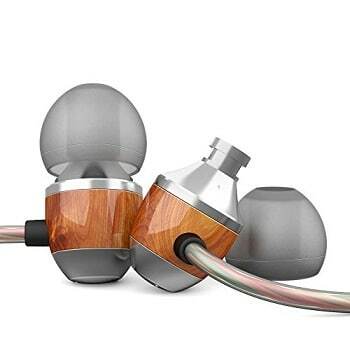 The headphones allow audio sharing by allowing you to connect to another H headphone via an audio cable .While simultaneously allows you to connect to two Bluetooth devices as well. These Custom fit supra-aural headphones have artificial leather earmuffs to give you that extra comfort. The producers created a product that allows you to buy in accessories such as a plug with audio cable for extra convenience. Thus you can listen to your favorite tracks without worrying about battery life. The symphonized NRG headphones make it to number 2 on our list because they are made of wood and wood provides the best sound reproduction. No wonder all the best speakers and instruments are made out of wood. You will feel like you are enjoying your favorite concert due to the wood, and neodymium magnets which provide high amounts of power to fuel the best quality there is. The headphones offer high durability, noise isolation and distortion free volume. Perfect for all music players and much more. Also they are the first in the ear headphones on our list so if you prefer in the ear headphones due to your specific requirements such as portability this is the best option for you. The silicon ear buds provide flexible comfort for various ear sizes (come with 3 different sizes of ear buds). The headphones have a built in microphone (to allow you to manage calls) and a nylon cable for durability. The audio jack is gold plated 3.5 mm so you lose no sound connection and the size makes it universally compatible with most devices in the market such as Apples, Android devices, and other portable devices. Our number 3 pick is worthy of this position as the design and smart engineering offer noise isolation and a stereo effect with clarity and enhanced acoustics. The headphones offer a universally compatible stereo jack so you can use your headphones with all your devices.Furthermore the premium durable cord easily threads through clothes and bags for easy wear. It even allows you to control your audio experience with a 2 button control system on the cord. Ultra-light weight, so your ear won’t feel under-weight even after hours of wear with an in ear canal design offers premium sound quality. 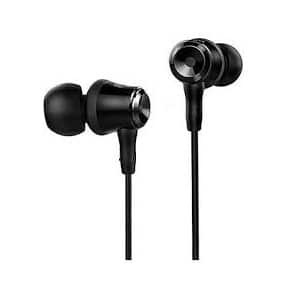 Comes with 3 sizes of ear buds for comfort of consumers with various ear shapes and sizes. Offers audio clarity with driving bass, and precision treble with universally compatible. At number 4 we have another supra aural (on the ear) headphones. 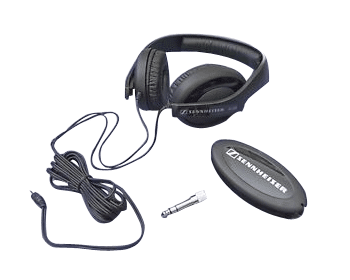 The Sennheisers HD 202ll are a closed headphone meaning they do not allow sound to escape out.So if you are looking for a closed on the ear headphone our number 3 pick is for you.The headset offers good insulation against ambient noise and a deep bass response making them the ideal companion for professionals. Or anyone who likes listening to powerful music. On the ear, closed headphones with dynamic sound stereo. The headset has a frequency Response 18Hz-18KHz.Soft, light weight, comfortable leather ear cups are removable for comfort and your ease. Specially designed damping perforation ensures powerful bass response. Lightweight diaphragm material with “turbine” embossing for extremely low bass. Powerful neodymium magnets and lightweight diaphragms for high sound levels. Powerful bass and increased signal levels for modern rhythm-driven music. Inculcates a flexible cord, which can be lengthened when needed plus a durable head band. The cable is a 3 m highly conductive OFC copper cable. And lastly for added consumer confidence the headset has a, 2-year warranty. Our number 5 pick is a headset produced by a consumer renowned company. Panasonic is famous for its electronics along with a favourite among a large group of consumers. Our number 5 pick may look like a basic headset with a generic look from back in the days but it is anything but basic. Our Panasonic pick delivers its money’s worth and that’s why it comes in on fifth place. 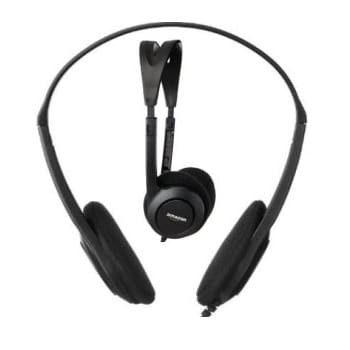 The headset offers comfortable wear-ability due to its cushioned ear muffs. As you wear them in comfort you experience a full bodied sound, free from any discomfort .The features our product offers will blow you away in comparison to its reasonable price. The headset is Light weight, comfortable on the ear, with a flexible headband.Inculcates 30mm neodymium drivers for top notch sound quality (rich bass and natural treble).Has a 4.5ft durable cord with no mic (Is best for IPhone) which can easily be threaded through bags and clothes. Lastly and most importantly, the 30mm drivers deliver a powerful base. Our number 6 pick has a very hi- tech exterior look but for good reason. The looks are backed with some of the best features. 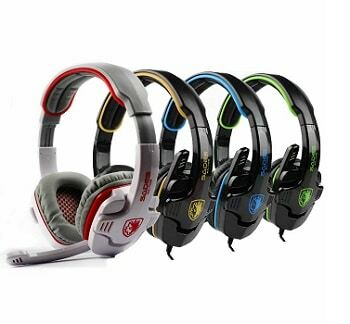 Because it is specifically a gaming headset, it has various features to enhance your gaming experience to the fullest. The Sades are equipped with high performance 7.1 audio decoding chips and uses 3D 7.1virtual loudspeaker displacement technology to give you a clear and advanced gamer experience. With a durable cord which facilitates you even when you are over excited during a game and to last you your money’s worth. As mentioned above the best headphones under 30 has 7.1 audio decoding chip which allows you to adjust sound in accordance to your need for each respective game, along with 3D 7.1 virtual loud speakers. Your gaming will now also be as comfortable as possible even after long ours due to the ergonomic design of the protein ear cups. Designed for your utmost comfort. Last but not least they have 40mm drivers with neodymium magnets and membrane much like our pervious picks higher up in the list. As you can see these headphones are useful for multiple activities. Universally flexible for all types of users.They even come in various exciting colours such as orange, pink, grey and so on. So you express yourself in style while you carry your music. These headphones are again on the ear headphones with the most comfortable earmuffs, and an adjustable head band. So you adjust your headphones in accordance to your needs. Looks like a lot of supra aural are hitting the market with a bang. 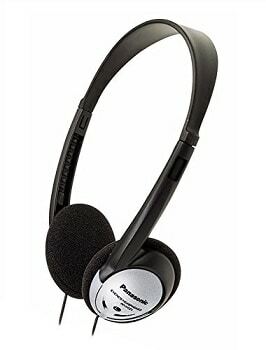 Also these bad boys come with an inculcated microphone so you can carry on voice calls while on the go at your ease. The foldable design makes our number 7 picks portable and easy to take along with you even though they are not the smallest headphones such as in the ear headphones. The Ergonomic design make it comfortable to wear because of the genuine leather earmuffs, with excellent noise-cancelling function. The cord is nylon and made extra durable and long lasting. At number 8 we have our third and last in the ear headphones of the list. 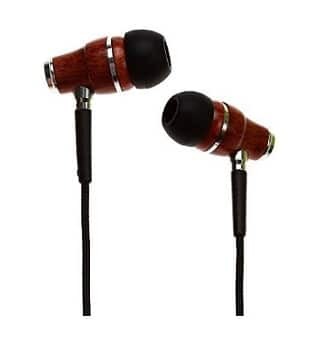 Again like the number 1 in the ear headphones these are also made of wood thus offer similar great quality and thus make it to our list at number 8. These headphones come with various silicon head buds to ensure comfort and flexibility for all ear shapes and sizes. They also come with a hard case carrier to ensure protection of your headphones as the price you pay is not nominal and you would want your piece to last you a long time. The set also come with a small carrying pouch. Talking about long term usage the cord is made extra durable to ensure that your headphones last unlike various other famous in the ear headphones which are known to become obsolete soon due to weak cords. The headphones are created using various important small elements and a wooden body to ensure crisp and powerful sound. What’s more is that they are designed to protect your ears. The headphones operate within the best frequency response curve, which will protect your ear. But that’s not all this frequency will give the most pleasant musical/ audio experience as well. The ear buds with natural wood housing lead to a better bass response and an unparalleled audio fidelity. According to the makers these are the next generation headphones as they are compact and portable and we agree. The small headset even gives you control with its one button allowing you to answer calls while on the move and or busy. The audio jack is gold plated 3.5 mm (universal) so no sound loss. The universal jack makes this headset compatible with a wide variety of products and brands such as Apple devices, Android smartphones, windows devices,MP3/4 and portable music players. 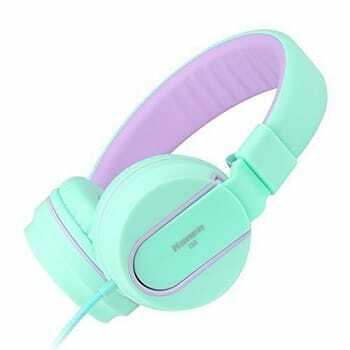 This headset comes in various colors such as black red, black blue, white blue, White green and white purple. So you can chose your favourite color and express yourself. These headphones have a very different design as they are rotatable. So you can rotate the earmuffs as you please.Furthermore they are foldable to increase there portability value.The headband is also adjustable to allow people of various head sizes and shapes to use them. The earmuffs super soft elastic memory ear pads are perfect for noise isolation. So you can get lost in your music without any distraction. Another point worth noting is that the plastic exterior is made with eco- friendly plastic. So you will be playing your part in helping the planet one song at a time. The wire is made of advanced braised nylon for good sound and durability. The headset comes with a 3 month warranty and life time technique support. The cable also has control buttons to allow you to control your device at ease. Some other specifications include; Driver diameter: 40mm,Impedance：32ohm, Sensitivity: 103dB +/- 3dB, Frequency range：100-10000HZ, Cable length: 1.5M and a universal3.5 mm connectors. What else can one ask for at such a reasonable price. Last but not the least on our list we have our number 10 pick the AmazonBasic lightweight headphones.These have a basic design but pack a punch when it comes to value for money and that’s why they are number 10. They come in 3 different colors; black, blue and white. They are a on the ear headphones with a comfortable ear piece to give you the utmost comfort.They come with a pouch so you can carry your headphones safely. The headphones are designed keeping in mind portability and flexibility to the extend that they are rotatable as well. With 101 decibels (dB) and 1000mW maximum input level.Frequency range of 12 Hz-22,000 Hz for great sound reproduction, so you don’t miss a beat.47.25-inch (1.2 meter) cord with L-shaped stereo mini plug to connect to your phone, MP3 player, or computer. These universal headphonesare good for all your needs. All the headphones mentioned on our list are top quality and the best within the industry. So choose the one which is in accordance to your needs and requirements. They all fall under a very reasonable price range of under $30. But also with in the list we have various prices so you can chose the best to your financial ease.